The ambience created in a tiny house or park model home can be completely romantic without much effort. A lot of the idea of small house living offers a quaint home that is cozy for a couple. 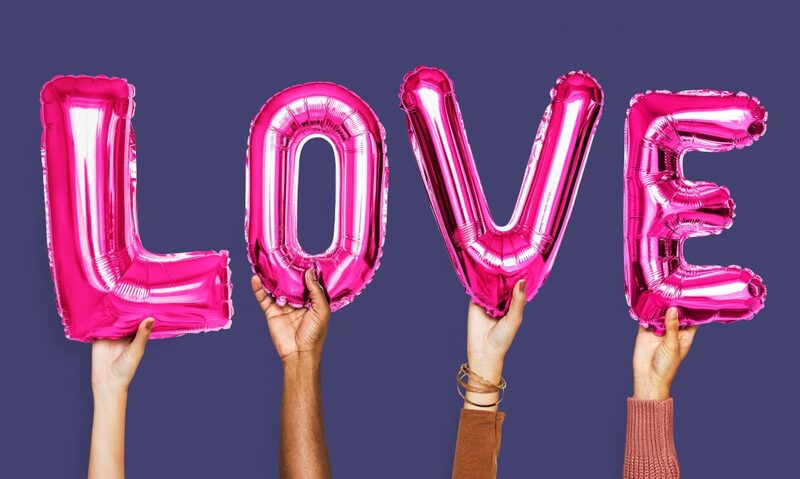 With Valentine’s Day approaching, here are five ways to make your tiny house or park model extra special for the one you love. Tiny house dwellers report higher rates of playing outside. So whether taking a hike together, going on a bike ride, or just sitting outdoors in a hammock, go outside together and enjoy the sunshine and the stars that tiny house getaways have to offer. Taking time to unplug and unwind can do much for helping you to ease everyday stresses and focus on each other. Creating a cozy environment can be easy in a small space. By adding simple touches like white Christmas lights, a couple of soy candles, and tossing a silk scarf over a lamp to create dim light, you are able to transform any room in your tiny house into a romantic getaway for two. If your park model home offers an elevated bedroom, create romance by being sure you have everything just right before you turn in for the night. This can be especially fun if you don’t normally use that space for sleeping. Whether you want to add fresh flowers to a nightstand, bring chocolates and wine up for a late night treat, or add that new fluffy blanket to the foot of the bed, be sure everything is in place to save yourself trips up and down in the middle of what should be time spent together. The quickest way to just about any heart can be a great meal. Whether you’ve chosen a residential stove, an apartment appliance, or a countertop set of eye burners, be sure you’ve put thought into the meal. Your special someone might love fresh veggies with dinner or prefer homemade waffles in the morning, but the thought is definitely what counts here and tiny houses are more than capable of producing dinner delicacies. Whether in the master bedroom, the living area, or the kitchen, remember to add little bits of what reminds you of your love for each other. You might choose a wedding picture in the bedroom, her favorite flowers in the kitchen, or even a hand-painted sink in the bathroom that you picked up on your honeymoon , these personal touches can change the entire mood of your home. Pictured below: Lisa Morgan, owner of Highland Lakes Tiny Homes and Michael Jordan, our first ever Winter Texan and guest blogger! Forward: Michael was inspired to write a detailed review of the Tumbleweed Platinum Cottage which housed Michael and his wife Pamela for 2 months earlier this year. They liked staying so much they are returning January of 2019 for two more months! The detailed analysis was enabled, in part, by Michael’s experience in the manufactured housing industry. Thanks, Michael, for being our first! I may not be the largest guy on my block but I’ve been heavy most of my life and I like some space around me wherever I go and in most things I do. You would think I might not be the most likely candidate to enjoy living in a tiny home but you would be wrong, especially when it comes to the Platinum Cottage. Beyond my personal space issues, I also like the space I am in to be sturdy and not cheaply made. You could say I want it to feel like it will hold up. 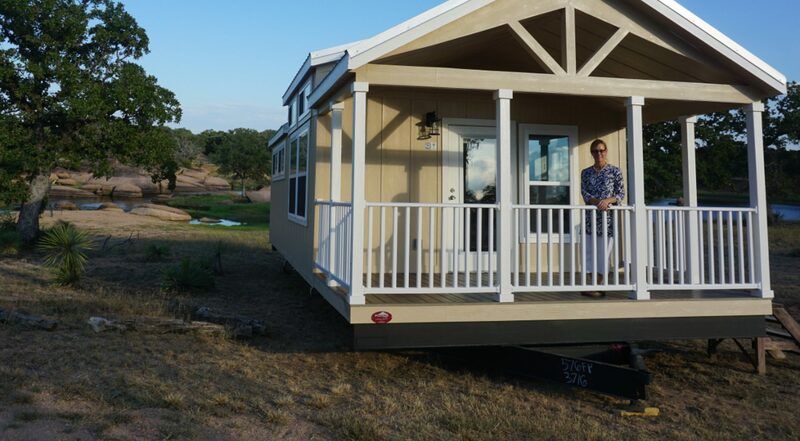 So for my wife, Pam and I, having the opportunity to live for a couple of months as winter Texans in a 399- square foot Platinum Cottage, has been an eye-opening experience thanks to Lisa Morgan and Mike Leamon of Highland Lakes Tiny Homes in Kingsland, Texas. We have lived in a 70 ft. singlewide Marshfield manufactured home and a 35 ft. travel trailer for an extended period of time and also in conventional stick- built houses such as the one that we now occupy in Iowa. In spatial arrangement, usage and quality the Platinum Cottage is superior in many ways. For starters, the Platinum Cottage has the look of a house even though it had wheels under it. Its large front porch (8×15’) has enough space to seat four people comfortably. The porch railings and decking are “house-grade” so they look and feel sturdy. The quality ceiling fan mounted overhead completes the great little deck. The large steel front door to this cottage has a lone star etched in the glass. The first impression upon entering the cottage is just how big this Platinum Cottage seems. The combination living, dining area and kitchen feels spacious and open with its high ceiling and extra width. There is a quiet three-speed ceiling fan above in the center of that area. I find the moveable, sturdily-built kitchen island in this space to be amazingly useful and converts quickly and easily from a food preparation area for cooking to clean up but most of all as a handy space to dine. Another huge plus to this Platinum Cottage is the full-size stainless steel appliances that are easy to use and clean, especially the convection/microwave combo located above the stove. For me the lighting in this “tiny home,” is outstanding. This Tumbleweed model has a loft that is carpeted and spacious but limited in its use due to its short ceiling height. It too is well lit, has plenty of electrical outlets with an abundance of recessed can lights that make the spaces there, as within the rest of this home bright day or night. The large windows not only let in a lot of light during the day, but provide excellent ventilation as well as fantastic views of Granite Lake where this Platinum Cottage is located. Cabinets in this cottage are abundant in both the kitchen and bath providing adequate space to store just about everything. The laminate simulated wood floors throughout the cottage on the main level are not only attractive, but easy to clean and good at hiding the dirt. Having a washer and dryer in this home has been extremely handy, too. Personally I like the double seat shower stall in the bath that has sliding real glass doors and is surprisingly easy to use and clean. The ceiling cut out in the shower can accommodate a person over six feet tall. The water saving porcelain stool and sink in the bath are also very nice both for ease of use and to clean. The bedroom in this cottage has a queen size bed but could easily accommodate a king. The windows in the bedroom are numerous and strategically placed both for best light and privacy. The double closets on each side of the deep drawer built-in dresser provide nice storage for clothes, hanging or folded. The fact that there are no built-in nightstands allows for some room rearranging if desired. I have also found the kitchen farm double sink very nice for doing dishes and clean up even though it is plastic and not porcelain or stainless steel. The laminate countertops throughout the cottage are easy to clean, appear to be durable, and are attractive as well. The solid wood pocket doors are also attractive, matching the décor throughout the cottage. The glide track works smoothly and the handles are recessed. 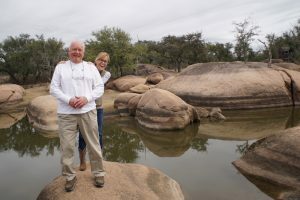 Staying on the shores of Granite Lake in the Texas Hill Country has been a joy not only for the view but for watching the wildlife that call this special place home …everything from black belly whistling ducks to Canadian Geese and other bird species to the many turtles that live here. Additionally Mike has created a walking/biking trail around the lake that allows a person to get up close and personal with nature, too. Lisa and Mike are very accommodating, providing use of a barbeque grill, fire pit, comfortable lawn chairs and even kayaks to their guests. For Pam and I living in this Platinum Cottage is living large in Texas. It is exceptionally comfortable, easy to use, easy to clean, offers plenty of space to relax, cook, sleep and entertain both inside and out, freeing up our time to explore more of the Hill country and the amazing state of Texas.